Something I learned while revisitingChristophe Lemaire’s debut collection for Hermès in the company’s showroom on Monday was that an important piece was cut from the lineup at the last minute. Well, it was not important, really, so much as it was something that would not have gone unnoticed. A live, snowy white falcon, perched on the arm of a model toward the beginning of the show, was actually supposed to be wearing a custom-made Hermès hood during the show. But the 21-year-old bird, whom the models were calling “Josephine” backstage, was so sweet and well-behaved before the show that her handlers decided to let her walk the runway au natural. I would not be half surprised if Josephine already has several offers from the big agencies. As for Mr. Lemaire, he was on to thinking about the next collection. Last May, in a surprise move, Mr. Lemaire – who had designed for Lacoste for 10 years, in addition to a signature line – was announced as the next designer of the Hermès women’s ready-to-wear collections, replacing Jean Paul Gaultier. EW: You had to start somewhere. What was the very first thing you put your mind to? CL: It was difficult. There are so many possibilities when you think about Hermès and its rich heritage. The difficult thing has been to edit or to focus my ideas, and discovering a new way of working. But it has been super exciting. For me that is really the first step. Valerio Mezzanotti for The New York TimesHermès fall 2011. After Lacoste, some people expected you would bring a super-sportswear mentality here, not knowing what your goal was. Did you think there would be any crossover between your past and what you wanted to do here? Lacoste is a sportswear brand. It is about functionality, easy-to-wear clothes, and also a bit timeless. It is a brand that is somewhere else on the side of fashion. In a completely different context, I think, Hermès is the same in a way. Hermès is a brand of functionality with extreme quality. At Hermès, we don’t say we do luxury. We do useful objects of an extreme quality. You have to think about the comfort, the functionality, the pockets, the way the clothes will age. The inside is as important as the outside. The extreme quality that you feel, rather than show, is extremely important. What did you want to say with this show? It seemed as if there were a lot of long tunics and caftans, but also references to Brazil. Did you purposefully mix cultures? I wanted yesterday to express this vision I have of Hermès, that we should all have something different. Hermès is somewhere else. I wanted the show yesterday to be suspended in time and space. You don’t really know where you are or where this woman comes from. It was a way to remind that Hermès is a brand that is open to the world, lively, always evolving, curious of other cultures. 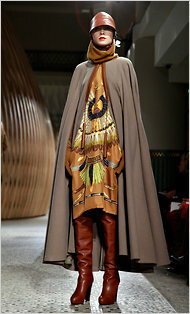 I thought about North Africa, Mongolia, the Hermès heritage, colors, the ’20s, etc., etc. What was interesting was to put them in a shaker and to try not to make them literal, but to make them contemporary for today. What do you do before a show? Do you have any rituals? I’m very normal. I just came back home Saturday night, a bit late, just watched the news. In the morning I run a little bit, I had my breakfast, a little bit in a rush, with my son and my girlfriend. How did the show feel? You looked a little overcome. It was very strange. I was, deep inside, very anxious. In French we would say “le trac,” it is the feeling actors have before they go on stage. But I was confident. The very first time I was in front of the board with all the team, I felt that yes, it looks good. There were obviously things I would improve in the future. If you had to critique your own collection, what would you say? I would like to go further in simplicity. Also, the inside of the clothes, there were things that I couldn’t really achieve because of the time. The clothes are extremely well made and beautifully finished, but I would like to go a bit further in that direction of perfecting inside and outside, but that is something you need to build season after season. You showed some pants that had boots attached. Tell me about those. That was the idea of these girls dipped in leather – leather legs. We had fine lambskin leggings in the same quality of the boots and sandals, and we also had these pants-boots, which were not easy to make. We wanted it to be clean, or monochrome – one fabric, one color. Just for the balance. Otherwise there would be too much information. I don’t know. I really like the idea of these leather legs. I like to make it elongated like that. Given the opportunities you have at Hermès, was there anything you were super excited about trying? We had this jacket yesterday in the show, worn by Ajak [Deng]. It is cashmere, but it is felted sculpted cashmere. It is hand made in Mongolia. It is an ancestral technique. They put the fiber of cashmere with water, and it is kind of like a massage. They create the fabric and literally sculpt the clothes, so that you don’t have any seam. It is all one piece. We were able to make stripes with the logo included in the fabric. I would love to go on exploring that ancestral handmade technique. I think that is absolute luxury, something you don’t see, but you feel when you wear it. There is this supplement of soul in these clothes. Any idea how much that will cost? Not exactly. I think 6,000 [euros]? It’s nothing. How did the falcon come into the show? Very early, when I started thinking about this collection, I had the idea of Diana the huntress, goddess of nature, and so the falcon came. Also I love the idea of showing a little bit of the wilder side of Hermès. I thought it was interesting what you said to Suzy Menkes yesterday: “It’s the malady of our industry – always to go quicker and quicker and that everything should be instant.” Tell me what you mean. It is a global disease of our time – the idea of consumerism, this perverse thing. And also the Internet is great, but it can also be a bit crazy this way of wanting everything to be immediate and zap to the next thing. In the fashion field, it didn’t create very interesting things. You need time to create quality. You need time to think. You need time to dream. You need time to step back. If you are always in a constant rush, running after time and trying to kill time, you become crazy. And you don’t produce real quality. That has been on everyone’s mind this week, but how do you propose to change that? I don’t know. We want to change that at Hermès by showing another approach to style. It is a house where you feel you can build season after season. There is a beautiful example in the buckles for the bags. There is so much passion in how to make the bag and making the hardware that has just the right noise when it closes. Some of the workers would spend three seasons looking for the perfect noise for the bags. Sometimes they will pick up a buckle that was made 20 years ago and they will rework it to improve it. I love this idea of improving every season, instead of washing everything away and trying to impress everyone and make a spectacle. That’s not the point. We need good quality product and honest product, and that makes you feel better. As a final thought, do you think the idea of Hermès will change with you as the designer? No, it a 170-year-old house. I am just a new chapter in the long history of ready-to-wear at Hermès. I will probably bring my point of view about it. For one aspect of the show, I asked Pierre-Alexis if he thought it was Hermès enough. He said, “It is not for me to say or not. It is going to be the people we show it to, our clients and the people that see the collection, who will decide if it is Hermès or not. If you feel that it is right, let’s do it.” It is open. It is a lively brand. But I do hope in my work here I will be able to bring something. We’ll see. That is not for me to say.